Businesses can open a new talent pipeline for middle-skills positions and help middle-class Americans find jobs by rethinking the four-year degree requirements for positions that didn’t previously require them. Researchers from Harvard Business School, Accenture and Grads of Life analyzed 26 million job postings, surveyed 600 business and HR leaders to document problem, propose solutions. BOSTON—The Bureau of Labor Statistics reports over 12 million Americans are either unemployed or underemployed, while new research finds that 3 in 5 employers report difficulty in filling middle-skills jobs – positions that require more education than a high-school diploma, but less than a four-year college degree. According to new research released today, more than six million middle-skills jobs in the U.S. are now at risk of “degree inflation”—the practice of preferring or requiring a college degree for jobs that were traditionally held by middle-skills workers. The report, Dismissed by Degrees, from researchers at Harvard Business School, Accenture and Grads of Life discovered that rising demand for a four-year degree for jobs that previously did not require one not only harms U.S. businesses, but also closes off critical career pathways for millions of middle-skilled Americans. This phenomenon particularly affects Opportunity Youth – young adults between the ages of 16-24 years who are not working or in school – further constraining their ability to enter and stay in the workforce. 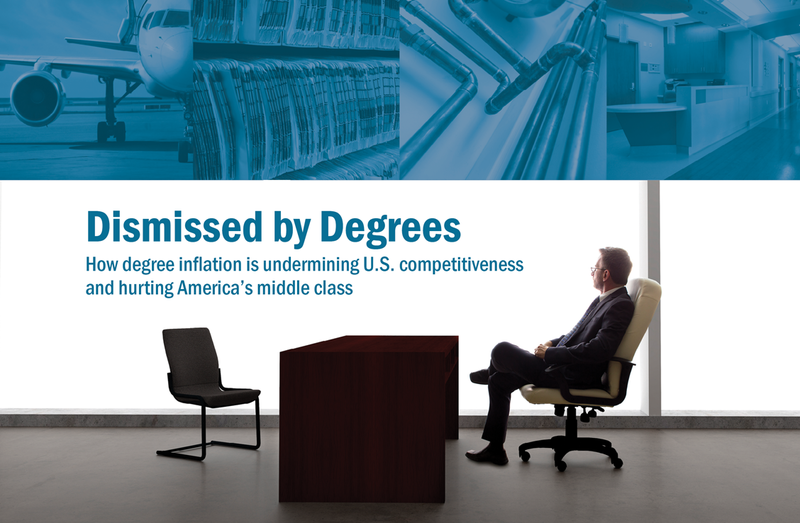 Degree inflation reduces the prospects for Americans without a degree to get jobs, thus limiting their access to a decent standard of living. The trend impacts positions such as supervisors, support specialists, sales representatives, inspectors and testers, clerks, as well as secretaries and administrative assistants. Those jobs were traditionally held by many middle-class Americans without a college degree. When the same job is posted today with the minimum education requirement of a college degree, it is placed beyond the reach of Americans who may not have a college degree, but do have relevant experience. In 2015, for example, 67 percent of production supervisor job postings asked for a college degree, while only 16 percent of people employed in that role had one—a “degree gap” of 51 percent. In one of the first efforts to understand the forces underlying degree inflation and its consequences, Dismissed by Degrees surveyed 600 business and HR leaders. The survey findings show that many employers began hiring college graduates in search of higher talent quality—in both “hard” skills such as specific technical credentials and “soft” skills such as the ability to communicate or negotiate. Over time, degree inflation has crept into more and more middle-skills jobs. Many employers admit that they now pay a significant premium when they hire workers with college degrees compared with middle-skills workers doing the same job. The survey also reveals that many employers find middle-skills workers with relevant experience equally or more productive than college graduates. Employers also report that hiring college graduates makes middle-skills jobs harder to fill and results in higher turnover and less engaged employees. In addition to the survey, Dismissed by Degrees draws on an analysis of 26 million job postings to dissect the degree gap across occupations. The analysis shows that if the current pace of degree inflation continues, 6.2 million more middle-skills jobs will be at risk as they shift to a four-year college degree requirement. Two-thirds of employers agree that requiring a bachelor’s degree for a middle-skills job makes the job more difficult to fill. Three in five employers reject qualified middle-skill candidates with relevant experience in favor of recent college graduates. Half of employers report paying higher compensation to recent college graduates than non-degree workers in the same job. Of those employers, 68 percent pay recent college graduates salaries 11 to 30 percent higher than middle-skills workers with experience. Yet, degreed workers are more likely to leave for a competitor. Employers generally perceive degreed and non-degreed workers in the same occupation as nearly or equally productive on many performance metrics. 1. Identify which middle-skills occupations are prone to degree inflation within their organizations and industries. 2. Explore alternative proxies to a college degree. Identify the specific “hard” and “soft” skills required for critical middle-skills jobs, and develop in-house or external training programs, apprenticeships, and internships to impart those skills. 3. Evaluate the hidden costs of hiring degreed workers versus non-degreed workers. 4. Invest in strategies that help the company attract and retain workers with the right competencies rather than depending on credentials alone. Grads of Life is a national initiative that catalyzes market demand for Opportunity Youth (ages 16-24) by transforming employer perceptions and hiring practices. Grads of Life places an innovative focus on the demand side of the talent marketplace and harnesses the power of the private sector to catalyze an employer-led movement to create pathways to employment for Opportunity Youth nationwide. Harvard Business School’s Project on Managing the Future of Work pursues research that business and policy leaders can put into action to navigate the complex, fast-changing nature of work. The Project’s current research areas focus on six forces that are redefining the nature of work in the United States as well as in many other advanced and emerging economies: Technology trends like automation and artificial intelligence; Contingent workforces and the gig economy; Workforce demographics and the “care economy”; The middle-skills gap and worker investments; Global talent access and utilization; Spatial tensions between leading urban centers and rural areas.